Too many Passwords to remember? Of course you have, we all do! This is an easy tutorial of how to store and carry around an endless amount of strong Passwords and User Names securely, without memorizing them or writing them in your diary (yes, a lot of us still do that!). Internet user accounts for banking, social networking and shopping are always being targeted by hackers. Just recently, a Trojan called Zeus Zbot acquired online banking user account information and stole approximately £6M from UK and £2M from US. 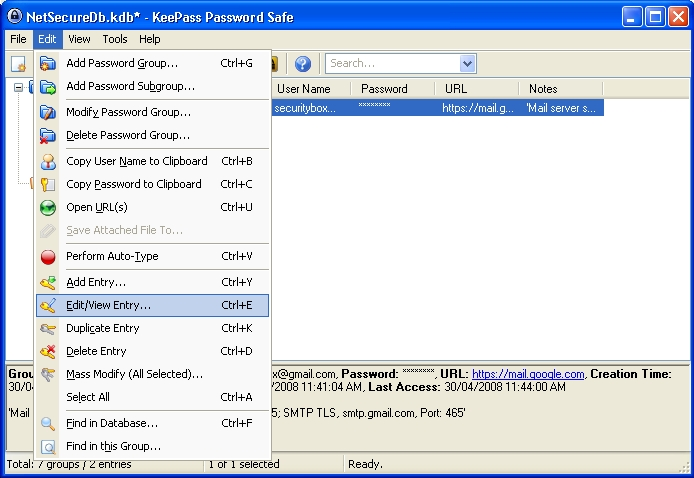 Get the free KeePass Password Manager which will generate very strong Passwords, and will make login into your accounts easy. 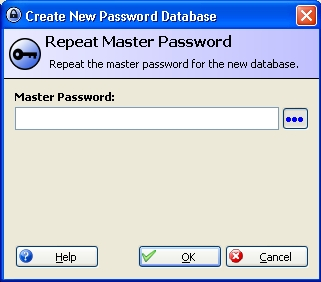 All you need to do is remember only One Password called the Master Password. In the sections that follow, you will learn how to create a master password, save your passwords, generate random passwords, create backups and use the passwords from KeePass when needed. You must come up with a single, unique and strong master password that you will use to lock and unlock your database of passwords. Then, you must save that password database. Step 2. Type the master password you have invented into the Master Password field. You will see an orange-green progress bar underneath the password entry. As you type in a password, the amount of green in the bar will increase if the complexity or strength of your password increases with the number of characters used. Tip: You should aim to have at least half the bar filled with green when you’ve done typing in your password. Step 4. Click: to see if you are typing in your password correctly. Warning: This is not advisable if you fear that someone may be looking over your shoulder. Step 2. Type in a name for your new password database file. Step 3. Click: to save your database. Tip: Remember the location and file name of your database! It will come in very handy when you are creating a backup of it. Congratulations! You have successfully created and saved your secure password database. Now you can begin to fill it up with all your current and future passwords. The Add Entry screen lets you add account information, passwords and other important details into your newly-created database. In the example that follows, you will be adding entries to store passwords and user names for different websites and email accounts. Note: The Add Entry screen presents you with a number of fields to be completed. None of these fields are mandatory; information submitted here is largely for your own convenience. It may prove useful in situations where you are searching for a particular entry. 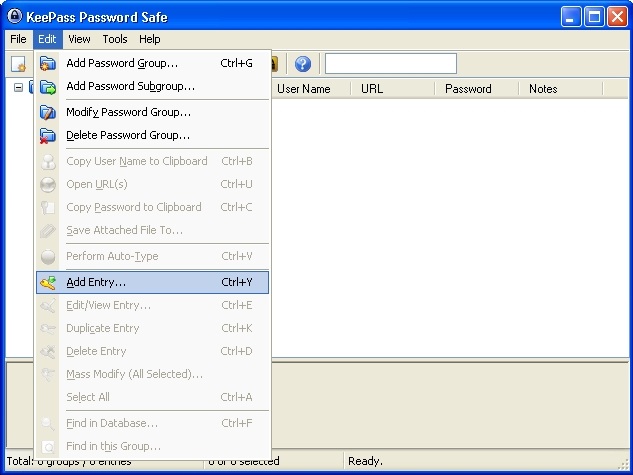 Group: KeePass lets you sort your passwords into pre-defined groups. For example: ‘Internet’ would be a good place to store passwords that relate to website accounts. Password: This feature automatically generates a random password when the Add Entry screen is activated. If you are registering a new email account, you can use the ‘default’ password in this field. You can also use this feature if you want to change an existing password for one generated by KeePass. Since KeePass will always remember it for you, there is no need to even see the password. A randomly generated password is considered strong (that is, difficult for an intruder to guess or break). Generating a random password on request will be described in the following section. You can, of course, replace the default password with one of your own. For instance, if you are creating an entry for an account that already exists you will want to enter the correct password here. Repeat Password: The confirmation of the password. Quality: A progress bar that measures password strength according to length and randomness. The moreÂ green there is on the scale, the stronger your chosen password. Note: Creating or modifying the password entries in KeePass does not change your actual passwords! 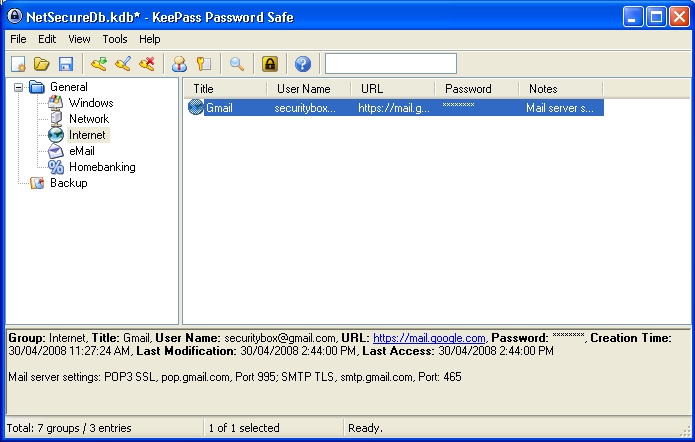 Think of KeePass as a secure electronic address book for your passwords. It only stores what you write in it, nothing more. Step 2. Click: to save this entry. Your password entry now appears in the Internet group. Note: The bottom panel of this window displays information about the entry selected. This includes creation, editing and expiry time as well as notes you may have recorded in the entry. It does not reveal the password. 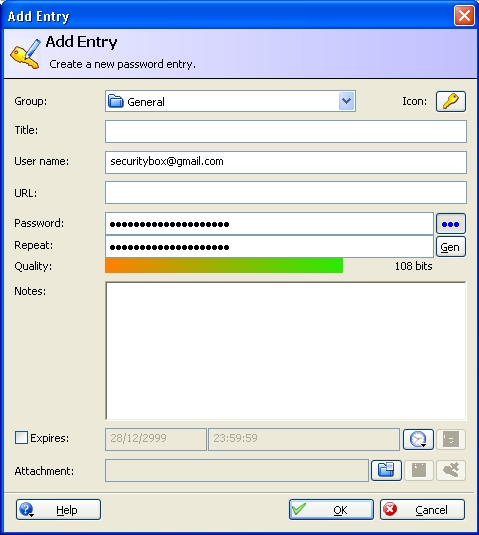 You may edit an existing entry in KeePass at any time. You can change your password (it is generally considered good security practice to change a password every three to six months), or modify other details stored in the password entry. Step 1. Select the correct Group in the left-hand side to activate the entries associated with it. Step 3. Click: to save any necessary changes to this information, including the password. 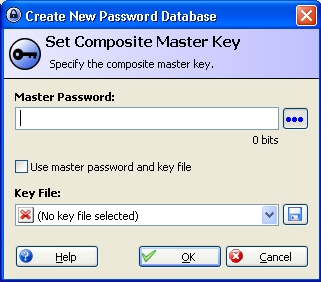 To change an existing password (that you previously created yourself) for one generated and recommended by KeePass, please read the following section. Long, random passwords are considered strong in the world of security. Their randomness is based on mathematical principles and cannot simply be ‘guessed’ by someone who is trying to break into one of your accounts. 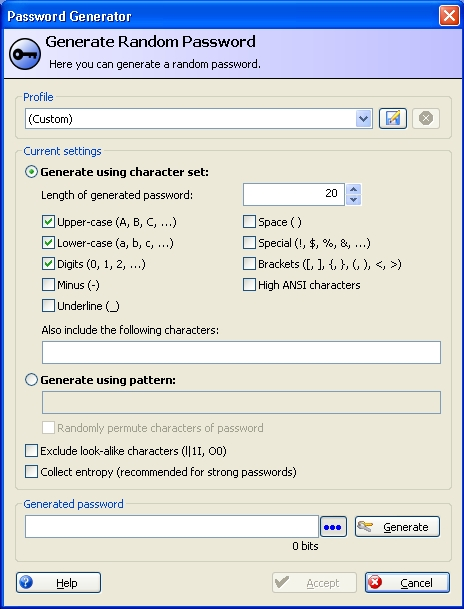 KeePass supplies a Password Generator, to help you with this process. As you have seen above, a random password is automatically generated when you add a new entry. This section will describe how to generate one yourself. Note: The Password Generator can be activated from within the Add Entry and Edit/View Entry screens. Alternatively, select: Tools > Password Generator. 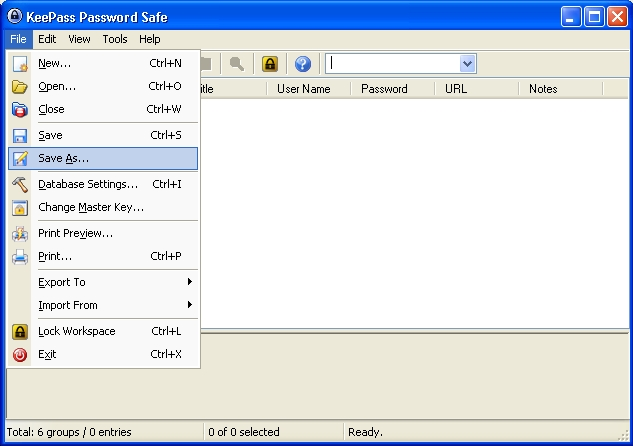 The Password Generator screen presents a variety of choices for generating a password. You can specify the length of the desired password, the pool of characters from which it will be created and much else. For our purposes, we can use the default options presented. This means that the generated password will be 20 characters long and made up of lower and upper case letters, as well as numbers. Step 2. Click: to begin the process. 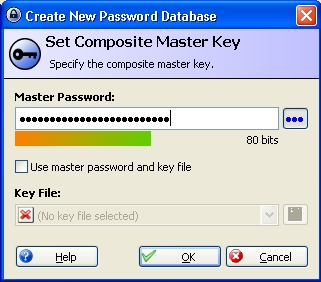 When complete, KeePass will present the generated password to you. Note: You can view the generated password by clicking: . However, this creates a security risk as we discussed above. In essence, you will never need to see the generated password. We will explain more about this in section 3.0 Using KeePass Passwords. Step 4. Click: to save this entry. Step 5. Select: File > Save to save your updated password database. You can minimise or exit the KeePass program at any time. When you open or restore it again, you will be prompted to enter your Master Password. 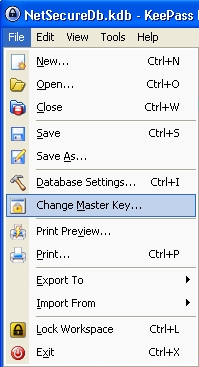 KeePass minimises itself, appearing in your system tray (at the bottom right-hand corner of the screen) as this icon: . Step 1. Double-click this icon to restore KeePass to its normal size. Step 2. Select: File > Exit to close the KeePass program completely. If you have any unsaved changes in the database, KeePass will prompt you to save them. Step 3. Upon opening or restoring KeePass from the system tray, you will be prompted to enter your Master Password. 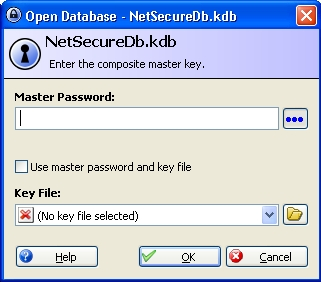 The KeePass database file on your computer is denoted by its .kdb file extension. You can copy this file to a USB memory stick. No one else will be able to open the database without the master password. Step 1. Select: File > Save As from the main screen, and save a copy of the database to another location. You can run the entire KeePass program from a USB memory stick. Please download a portable version of KeePass from http://portableapps.com/apps/utilities/keepass_portable and install it on your USB memory stick. You can change the Master Password at any time. This can be done once you have opened the password database. You will be prompted to type the new Master Password twice.